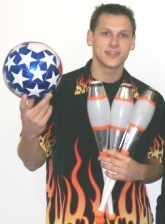 The amazing Chris "JuggleBoy" Fowler will juggle balls, clubs, rings, basketballs, and more! His show includes a balancing act and a lot of fun for the crowd! You will have to see with your own eyes - one of the best juggler's in the world. Chris is certified as the top gravity fighter by the USA space exploration team. Simply incredible! * A co-world record holder in Juggling. * Placed as the #1 U.S. Juggler on ESPN. * His "High-Energy" show lasts 20-30 min. & will be enjoyed by all ages. * Chris is always family-friendly and crowd-friendly. * JuggleBoy will work hard to help make your event a success. Chris "Juggle Boy" began his juggleing career at age 12 for a school talent show. Since his first performance he has gone on to tie the world record for juggling 9 sticks, placed as the #1 US juggler and #3 in the world in advanced ball competition on ESPN Sports. Chris has juggled for many companies and many events, such as: the UNC Women's Basketball Half Time Show, the North Carolina Military Appreciation Event, Malls, and an exhaustive list of Fortune 500 Companies. His personal records include: 9 stick juggling, 7 club juggling, 10 ring juggling, and managing to keep 11 balls in the air with 13 clean catches and throws. A very talented and high energy show, Juggle Boy will add a lot of excitement to any event. 100% Clean Family Friendly Entertainment. Fun for All Ages! EVENT TYPES - Birthday Parties, Company Party, Fairs, Festivals, Carnivals, Grand Openings, Restuarants, Churches, Schools, Daycares, Upward Awards Night, Holiday Events, Corporate Events, Neighborhood Parties, Halftime Shows, Gospel Show with Magic and Juggling, Gospel Show with Juggling and Balloons, Kids Birthday Party, Children's Party, Company Promotions, etc. ENTERTAINERS - Magician, Magicians, Magic Shows, JuggleBoy, Juggle Boy, Juggler, Jugglers, Juggling, Magic and Juggling Show, Stilt Walker, Stilt Walkers, Balloon Artists, Balloon Sculptures, Balloon Art, Balloon Animals, Balloon Twisters, Upward Speaker, Upward Entertainers, Upward Juggler, Upward Magician, Birthday Magican, Variety Show, etc. Variety Show Options: Magic, Juggling with Balls, Clubs, Rings, Giant Float R's, a Balancing Act, Balloons, Comedy, & more! Based in Raleigh, NC - WILL TRAVEL TO ANY AREA - Cary, NC Juggler; Durham, NC Jugglers; Chapel Hill, NC Juggling; Greensboro, NC. Chris Fowler Juggler; Juggling Show, Juggling; Charlotte, NC Juggler, Jugglers, Juggling Show with Chris "JuggleBoy" Fowler. SC Juggler, VA Jugglers, FL Juggling, GA Juggling Show, TN Juggler, OH Jugglers, and beyond! Home of Juggle Boy! Thank you for considering JuggleBoy the Juggler for your event!